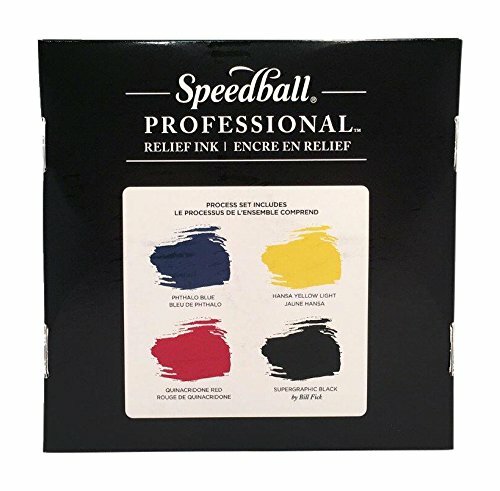 Speedball Professional Relief Ink is a water-miscible, oil-based printmaking ink comprised of the highest quality, lightfast pigments available with no added fillers. The ink delivers rich, intense, crisp prints with the archival qualities professionals demand and is formulated for the working properties professional artists desire - consistent roll-out, beautiful transfer and tack, and holds fine details. Just as importantly, the ink easily cleans up with soap and water. Four-color set includes: super graphic black, quinacridone red, hansa yellow, and phthalo blue.